When climbing Mount Merapi, it's best to start in Selo, a village north of the mountain, situated in a valley between the Merapi and Mount Merbabu, a non-active former volcano and Merapi's next neighbour. The travel guides and the local guides of flesh and blood recommend to start at 1 a.m. in Selo, to be on the top or at least the plateau below the top at sunrise, what is about 5 a.m.
That means first that one needs a guide, because one couldn't find the way without a guide in the dark, and second it's not good to walk up there in the dark, when one sees nothing of the surrounding and needs torches as well. Besides, leaving at 1 a.m. means a missed night. In my opinion it's best to forget about the sunrise and start at 5 a.m. The first few hundred meters of the way are paved and still part of the village. Then a forested stretch starts and that is actually the longest part one walks. 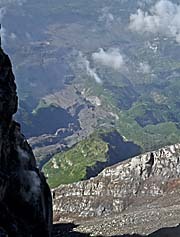 Here and there are stunning views around on other volcanos or downwards to Selo and the surroundings. 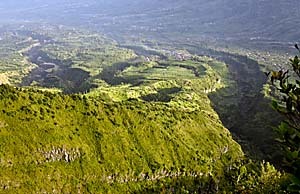 A number of big canyons is to see at the foot of Merapi. They were formed in former eruptions. 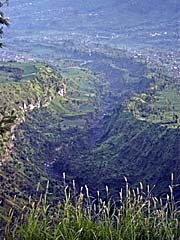 The biggest canyon now leads from the caldera's opening to the south for several kilometers. It's the draining off of the last outbreak of 2010. Short before reaching the vegetation border I met a larger group of Westerners, coming down already. They weren't up at the top, but up to the plateau, to watch the sunrise from there. I heared them from far already - they were quite noisy. Though, far not as noisy as the Javanese I met a bit later. They started their tour already the night before at 10 p.m. in Yogyakarta, having a three-hours bus trip to Selo (one can not sleep in the bus), then starting the climb in middle of the night. After the climb they rested just for an hour in Selo and drove back then again to Yogya. Rough trip. Many tourists are quite rushing through Southeast Asia. After leaving the vegetation zone there is a strong, cold wind. The ground consists now of volcanic boulders. Next station is a small peak with a small plate. 'Monument Kenagan' is written on it. In the concrete of the monument are two footprints. Not much further one reaches the 'plateau', a point which provides an already stunning overview over Merapi's surroundings and it's peak. Until here it's a steep, but safe walk, and, after all, not really a challenge for somebody with an average stamina. Many visitors don't go further. From here on it becomes not only difficult to walk but also dangerous. Being without a guide you have to take a careful look up to the peak and where you can walk up. If you go straight on or walk even to the right side, you can't reach the peak but will end up at steep, impassable big rocks. The only way up from here, so far I can say, is keeping to the left and finding a way up there. 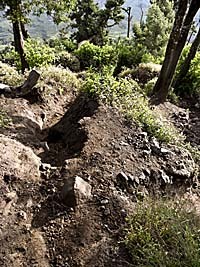 Soon it get's very steep now and the ground consists either of volcanic boulders, smaller stones, or a kind of mud which appears like sand with smaller stones in. All is very loose and if you make a step of 30 centimeters your foot will slide back 25 centimeters. Therefore it's quite a strain to make progress. Walking up to the top now is really a challenge. Slippery is a real danger. There is another concern which is much more serious. Below the peak are stones and rocks, some of them are really huge. It happens sometimes that some fall down and cause avalanches. Since you are fighting for any centimeter, you can walk only very, very slowly. Should there appear an avalanche into your direction, you could barely escape it in the snale speed one is reduced to. Avalanches appear mostly from late forenoon on, when the sun dries the damp ground and heats it up. Another concern are appearing clouds. That's generally so in the mountains. Clouds can appear at any time, here mostly from about 10 a.m. on. If it gets really cloudy, you can't see your hands in front of your face anymore. It makes one loosing orientation. Even noises (screams for help e.g.) are muted in the mist. Another danger is the steepness itself. The last part is really steep, and if you slip or the ground under your feet get's loose you might slip down the slope for meters or dozens of meters. You would certainly break some of your bones and probably being knocked out. 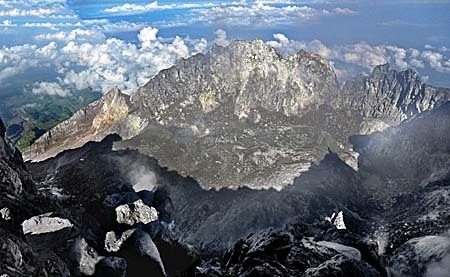 Next thing is that moody Merapi might emit poisonous gases who can affect the strength and concentration. You need to be very concentrated at the last part of the climb - every step must be firm and you must care where to step on. Finally, if the volcano spits out small amounts of lava, what always could be happen, you could be hit. Already a small peace with a diameter of a centimeter would burn deep into ones flesh and keep the victim very busy. If you are already quite far up, you might yourself cause avalanches. That might hit people who move below you. In reverse people climbing above you might cause the same to you. Be aware of that the verymost people going up there are not aware of such dangers. 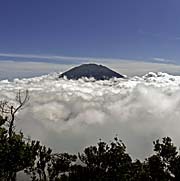 When being once up on the top the hiker is rewarded on a clear day with not only a majestic view over the further area, even until Kaliurang and behind, but also with a magnificient view steep downwards into the caldera. 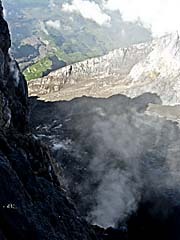 The caldera's opening now is pointed to a southern direction, where Kaliurang is situated. Kaliurang is, although further away, more endangered by the Merapi than Selo is, which is situated just at the foot of the mountain. Being at the edge of the caldera means not being at the very summit. The real peak is some twenty, thirty meters above the part of the ridge where one can go and which forms the edge of the caldera. 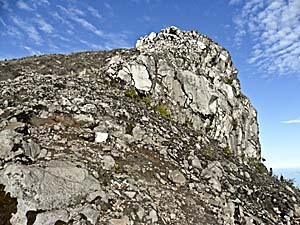 It's not possible to climb up there except with mounteneer's equipment and the adequate experience. Therefore it's possible to surround the ridge further down and walk at the lava outlet into the caldera. Christian Arwuy, an over decades experienced Merapi guide in Kaliurang (Losmen Vogel), told me that he has information about an expected eruption in about one month. That would be then in about mid-July. Short behind the plateau are a few big rocks. That is known as a resting spot where is some shade. Sometimes Indonesians camp there for a night. The guys I met there were as noisy as they could. They were part of a bigger group. Indonesians come usually in really big groups. Further up was another part of this group, screaming downwards. They were to hear from kilometers away. When I met them later, they were impudent, actually provocative already. A great deal of Indonesians show by distance the lowest behaviour I experienced in Southeast Asia. That might be one of some more reasons why so few western tourists come here anymore. On the hike up the Merapi alone I have been annoyed and provocated two times by groups of younger Indonesian men. The fact, that Javanese (Muslim) society is so male-dominated is part of the problem here. In gender-mixed groups young men merely act that shabby. Here many maintain a pubertarian behaviour until they are above 30 years old. After I was already back down from the peak and walked up another ridge a few hundred meters north of the caldera, I saw two other groups, each of them three people, climbing up. The first group climbed too far to the right side and couldn't find there way further on. First they were considering where to go. The only way for them, as I saw it, was to climb down a third of the slope and then turn to the left. But they couldn't see that from up there. So they started to cry out for the noisy Indonesians down at the rocks. They of course screamed back, but didn't give them a clue. Additionally the guys down started an irritating firework. Meanwhile clouds were appearing from the north and coming upwards in a high speed. Time to go down. I would say, the two late-comer groups made three mistakes. First, they started too late, so that they arrived at the plateau in the time after nine o'clock when it get's warm already. Second, they didn't check where to climb carefully from the plateau on and went wrong. A mistake which is difficult to realize when once being up and hard to correct then. Third they didn't care for the upcoming clouds. They had to cancel their climb and to realize, that they failed. Better to try it next day again. 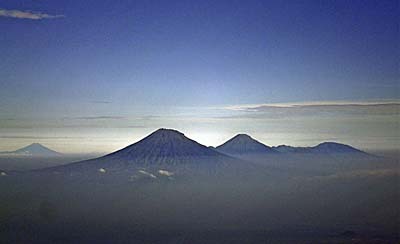 View from Mount Merapi to northwest: the first peak is Gunung Sumbing, right behind Gunung Sundoro. The high plain further right is the Dieng Plateau. The volcano in the background left is Gunung Slamet (3432 m). The climb up the Merapi is not so easy. If one is in a good shape, he/she can quite easily climb up to the plateau (two to three hours). The last part is only recommendable if one is very carefully and aware of and willing to take some risks. People died here already and others got hurt or lost in the fog. The last part is also a bigger challenge for the stamina. One does not necessarily needs a guide, but for unexperienced hikers it's better to take a guide. The way down isn't that easy either. It's steep and slippery and requires concentration and strength. A normal time to go up to the peak is about four hours, another four hours for the way back. Take a big bottle of water (1.5 liters) and a bit food (e.g. cookies). If there is anywhere in Indonesia a hike possible, which is half-the-way considered not being easy, it's for sure that 99.0 % of the men in the village are self declared guides. They offer there services to any visitor as frequently as the becak and ojek (bicycle rikshaw and motorbike-taxi) drivers do. Most of them speak no English, almost all of them know nothing and if it comes to an emergency situation, they have no idea what to do. In compensation for that they have a big mouth. It's not easy to find a good guide.